For 25 years, the Avera McKennan Foundation has raised money to help the Avera McKennan Hospital fight breast cancer. 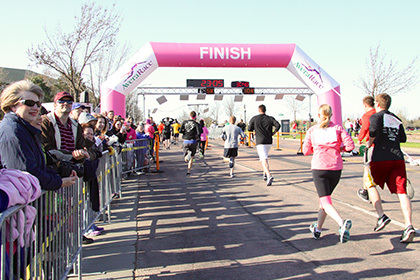 On May 11, 2013, they celebrated the 25th anniversary of the Avera Race Against Breast Cancer. But that's not all. By taking their race to the next level and adding an inflatable arch, the Foundation crossed a million-dollar line with $3.1 million raised since its first race in 1988. That, in and of itself, is incredible. But the Foundation also reports that 100% of proceeds benefit the Avera Cancer Institute in South Dakota. When asked about the addition of the inflatable arch, their Annual Giving Coordinator, Missy Keiper, said, "With us celebrating our 25th anniversary we wanted to really jazz up the event. We needed to have some sort of attention-grabbing start/finish line. We knew having a big, pink inflatable would be appealing to our participants and add excitement to the event. We also wanted to use the inflatable as an opportunity for our sponsors to place banners at the start/finish line." The arch proved to be a great photo spot for runners and their families, and made an excellent backdrop for those sharing on social media as well. Missy added, "We had a very positive experience working with Landmark Creations and were very impressed with their service and how quickly we were able to receive our inflatable. The product is high quality and super easy to use, which makes a huge difference when setting up. We would recommend Landmark Creations to any event!" Looking for more creative fundraising inflatables? Visit our online galleries!